9am - Since moving to Apple Valley, there have been no trips to the library. I don't even know where the library up here is located. When I lived in La Mesa, I went to the library 1-2 times a week. Mostly for DVDs. Last nite at bedtime, "library" crossed my mind. I made a note about library in the little note taker. [Note taker is a small piece of plywood to write on with a clip for holding papers and a pencil. It's a tiny clipboard]. This morning, we will take that library trip! I have Blogged about this topic before. However, because I've Blogged my weight recently, Readers have emailed asking what I do? I prepare all the food that I wish. Then, I taste that food but concentrate on being sensitive if I am truly hungry. If I am NOT hungry, I don't eat it. That's it! Using this method, since the middle if 2016 I am down from 182 lbs to 151 lbs. From the Apple Valley Library, I brought home an adventure movie. Kind of a wonderful fairytale like movie named, "The BFG" [Big Friendly Giant]. In the move, an orphan human girl befriends a benevolent giant, dubbed the "Big Friendly Giant", who takes her to Giant Country, where they attempt to stop the man-eating giants that are invading the human world. 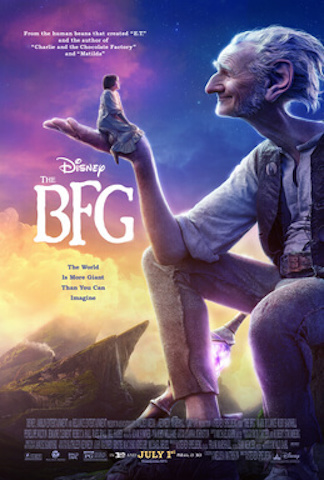 The BFG is directed by Steven Spielberg and is based on the book by Roald Dahl. It is a delightful movie! I loved it! Good job on the weight loss, sure make you feel much better. Our kids really liked that movie... However, the book is better. We love your scampy trips! When I began Blogging in May, 2003, my goal was to be of service to RVers. If I have been of service to you, that is so very good to know!